Also, I just used Chicago Miniature 8097 bulbs (couldn't find the Radio Shack bulbs) to successfully replace the two shifter backlight bulbs. Thanks all! I just did it, Lord Donnington's first way (leaving the circuit board connected inside the car. ) The tiny screws on the underside of the J-gate were Torx 8 or 10, and the two on the sides took a square-hole 1/16th inch driver bit. I had a set of weird small driver bits from Harbor Freight (I think about $6 for the set) with about 100 such strange bits, so I had everything. I think the connector is soldered to the board, nonremovable. For some reason I didn't take any pictures when I did mine, so I can't say for sure. I helped the OP with this when he first came to tackle the job, but it appears there may be some info missing. The J Gate assembly can be taken out the car as a whole and dismantled in an area of your choice, which makes the whole job easier. 1) Remove everything as described in the thread. 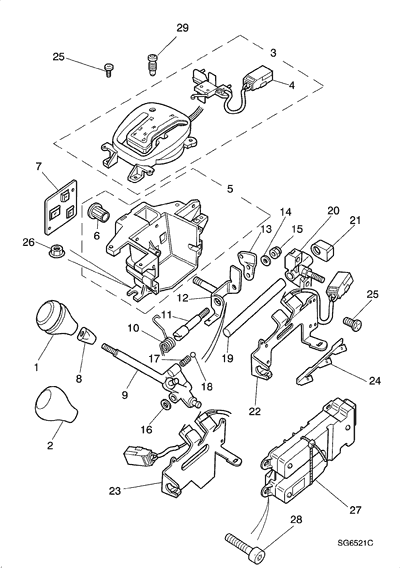 2) Undo the 4 gold screws that hold the J gate to the car. 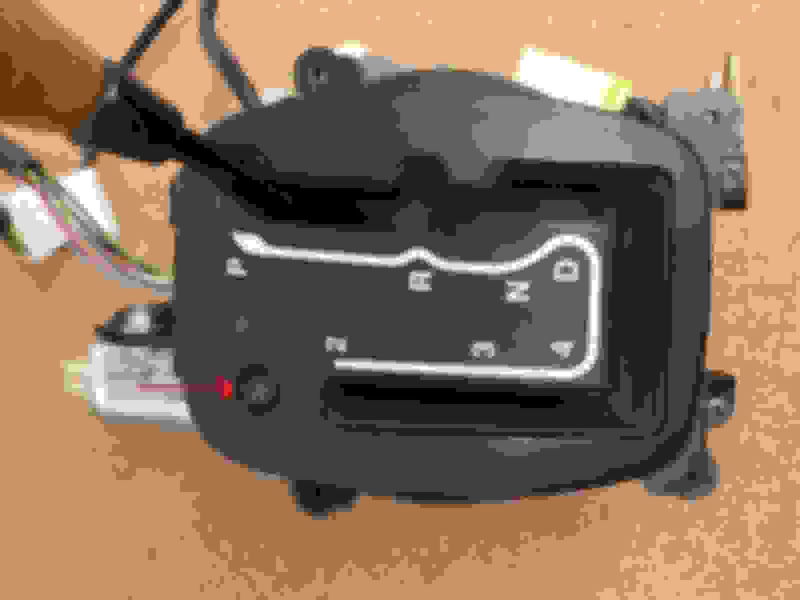 3) Unplug the white connector to the L/H side of the shifter which is under a blue connector (This is the climate control panel plug BTW). 4) Unplug the grey connector clipped to the R/H side of the shifter and remove it from it's mounting clip. The J Gate can now come out. 5) Remove the large plastic Torx plug on the J Gate fascia. Turn the unit over and remove the micro switch mounting. 6) Undo the small torx holding the wheel on. Undo all the screws you see underneath, not forgetting the tiny one at the bottom end of the unit. Now you can take the fascia off. When putting it back together try not to over tighten any of the screws to the fascia as they will damage the outside face. Last edited by Stu 1986; 10-26-2016 at 02:04 AM. Mine works only when going from park to reverse, so I'm wondering if some sensor instead of the bulbs is the issue. Your j gate is only backlit when shifting from p to r? Or are you talking about the gear indicators? All the J Gate should be backlit. I have an XKR and from what I remembered there were two soldered bulbs I replaced. Pretty sure connector is soldered to the board but it does unplug at the other end so it can be taken out. I have indicators red light that shows you the gear you select. I think they're LED and might all be lit but the disc on the J gate covers them and only shows one lit depending what gear you select. Could be wrong on this but not sure. If your connector is damaged then the board could be. Infact when I unsoldered my old bulbs I damaged the tracks on the circuit board and had to hard wire. Also just to mention if anyone is doing an XK8 or XKR. The hardest thing was unclipping the J Gate plastic surround without causing any damage. After removal there are two curved shaped metal bars at either side. They just mianly support the wooden surround but they do restrict the removal of the J Gate plastic surround so on reassembly I didn't fit these bars just incase I need to remove everything again. I also know there is a youtube video showing the J gate removal by unclipping and lifting up with a credit card but it is definitely not that easy. I think XJs might be slightly different regarding the wooden surround. Now I know I need to replace a couple bulbs, but my question is what would make the still functioning bulbs only work sporadically when I go from reverse to neutral or over to 2nd gear. Once I get it apart to replace bulbs what's the light catalyst I need to check for, is it a button etc. They are small incandescent bulbs soldered to the circuit board, over the years it’s likely their connection with the board has diminished slightly. I had a part time bulb on one of my old cars, replacing the bulbs with new ones really solved the issue. It’s probably also worth chrcking the connector plugs are clean and tight. It really does look well once it’s lit up as it should be. Dry solder joint, perhaps. Or failing bulbs. Or not being told to illuminate. A meter should let you see which of those. Having a time finding these bulbs & I'm stateside ?! Buy the assy from a wrecker/ebay? I had the bulbs from Radio Shack, but had my friend who is also the OP send them to me here in the UK. He had to drive around three different Radio Shack stores to find them for me, but I've got a healthy spares supply now. The ones Samilcar has posted a link to look good. I've found these similar bulbs on eBay, these may do the job. The only other thing you could try is fitting white LED bulbs with the OEM blue covers on them. Those ones are similar to the ones I eventually used.Had to get them from China in the end. But they seem to be out of stock of the 12v ones at the moment unfortunately. I will gladly send you some if you can't source any over there,I have 98 left . PM me anytime my friend,it would be a pleasure to help out. Cheers ! But I will roll w/ these. I have to re-open my J-Gate to loc-tight a stripped screw that came loose & prevents shifting @ the most inopportune times. All this started in my quest to bring light to every available area lol(installing new J-Gate bubs). Not looking forward to this @ all. It would be easier to just remove the shifter module & install a used one right ?! Wrong, no one sells them being tested w/ working lights, hence why I am in this situation in the first place lol. I'm versed in getting to the module, but as far as opening it up, I am a novice. Anyone know a part # for the screw or plug in the pic below, I can't remove mine & my replacement part doesn't have one.